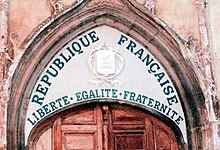 Motto of the French state, on a church door. Separation of church and state is a phrase that was used by Thomas Jefferson in a letter to the Baptist Association in Danbury, Connecticut. The Supreme Court of the United States, in 1962, took the phrase in their decisions to make school prayers unconstitutional. This idea has been put into effect in a number of countries. This page was last changed on 28 July 2013, at 18:47.